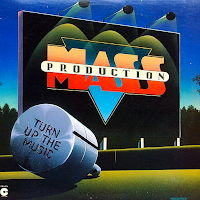 Just a nice and tasty instrumental from Mass Production. It's been a perfect opener for me at a BBQ or day time party. Something I'm really enjoying lately. Being in the park, or in someone's back yard playing a cut like this getting them ready for the funk yet to come. This is from their 1981 Lp "Turn Up The Music". A few sailing guitar, synth, and trumpet solos separated by head nodding melodic funk. Nothing like it.